1972 Graduate of Brown Institute of Broadcasting in Minneapolis. Secular radio from 1972-1976. 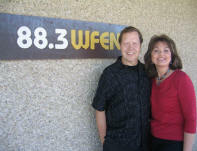 Christian Radio from 1976 to present, the last 17 years as manager of WFEN in Rockford, Illinois. There are many duties for a station manager but I still do an air shift from 6 to 8:30 in the morning. It’s a mixture of music, news, weather and sports and I inject a little humor as well. Sharing my faith is always interwoven in the fabric of the programming. Ministry vignettes are a part of our breaks as well as a scripture verse at the top of each hour. If we inform and entertain without ministry, then we are no different than secular radio. I believe you can be relevant and still let your “little light shine”. The technical advances keep happening, making programming easier than ever. Downloading with the computer makes life easier with programs and music. I think that more Christian stations are going to the music- only format, dropping long form teaching and preaching programs. It depends on the market and the monetary needs of the station. If it’s a commercial station competing for the dollar, the GM is concerned with having a good sales staff and at the same time seeing to it that his music and programming is as good and professional as it can be. He should be aware of market demographics and be in touch with the community he serves. The GM should be the cheerleader of his staff and also a spiritual leader. Cut them some slack and let them use their God given abilities. They will feel their value when the work they do is valued and appreciated. That again depends on the market, your budget and whether you are commercial or non-com. I think that association with Christian concerts and other public events is good and being involved in charitable endeavors is good as well. But if you’re doing it only to be seen in a good light, then there is a motive problem. I have had problems over the years getting all the radio service I need from record labels, partly because of the turnover in music providers. Since the advent of I Tunes an Play MPE, music downloads have been a breeze and you can get all the artist information you need on the internet. Christian radio faces the same problem as all radio, other forms of media. The younger generation is not as likely to listen to the radio as much as their their parents did. For Christian stations that carry talk programming, the specter of the so-called “Fairness Doctrine” is daunting. There are some high powered liberals who would like to muzzle the moral and conservative leanings of Christian radio. Of course raising the funds needed to operate is always a challenge. I think the challenge is to walk with God, so that what you do on the air is not only professional and relevant, but also powerful for the advancement God’s kingdom. I think there are a lot of great stations out there, but innovation is a bold word that indicates change, “going where no man has gone before”. I’m not sure I know of any. I think Christian radio is a “calling” for many. I think we will still be playing music and broadcasting programs and using the latest technologies. We will still be agents of change, because Christ is an agent of change and the message that we broadcast is full of His life!